Dental anxiety is a common issue that can be a deterrent in receiving the dental care treatment you need. If you find going to the dentist stressful, you are more likely to put off routine dental care and treatments you need for optimum oral health. At Definition Dental, we want our patients to feel relaxed and comfortable when visiting our office, so they can preserve their beautiful smiles. Our sedation dentistry options can make the dental care you need less stressful, relieving your dental anxiety. It is not just those with dental anxiety that can benefit from sedation during dental procedures. Some people have sensitive gag reflexes that make it difficult for them to relax while receiving dental care. Others may become restless during longer procedures, while others do not respond well to anesthetics. Sedation dentistry allows anyone to have a relaxing experience while in the dental chair, regardless of the reason. At Definition Dental, we offer two levels of sedation: mild or moderate. Mild sedation is used for those with a lower level of dental anxiety. We offer nitrous oxide, which is inhaled and imparts a relaxed, euphoric feeling for the patient. This is a good option for those that will need to drive after the procedure, as the effects dissipate quickly once the gas is no longer inhaled. 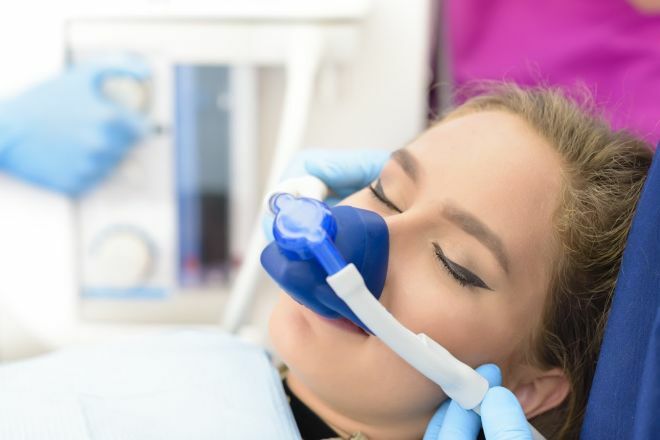 Another mild sedation method is through oral medications that are taken before the dental treatment for relaxation, but the effects of this option may last longer. Moderate sedation is used for our patients that have a higher level of anxiety, a problem with gag reflex or are undergoing a long procedure. This is usually given in two steps. We recommend our patients take a medication before they go to sleep the night before they have their procedure for a good night’s rest. Then another medication is given when they arrive at our office. This puts the patients into a deep relaxation state; often they won’t remember the procedure and will feel like they were asleep, even if they are awake. Moderate sedation requires a friend or family member to bring the patient home after the treatment. Sedation dentistry is a wonderful option to ensure that everyone can comfortably receive the dental care they need. Contact Definition Dental today to ask about our options before your next dental treatment.